The Name is Chow. 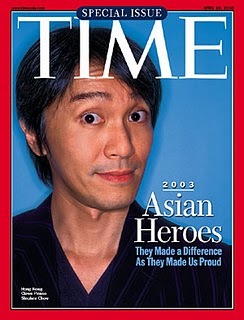 Stephen Chow. While doing a search on Wikipedia for god knows what*, I stumbled upon the following, Stephen Chow-centric entry. I had heard the term “Sing Girl” before, but I had no idea it was such a big deal to warrant a full-length article on everybody’s favorite online encyclopedia. In any event, a “Sing Girl,” according to Wikipedia, is “a nickname for actresses who starred alongside Stephen Chow, often as the main character’s romantic interest.” Such Sing Girls include Athena Chu, Cecilia Cheung, Karen Mok, and Eva Huang. Whether or not any off-screen romantic action is included or implied in this definition of a “Sing Girl,” I do not know. To be perfectly honest, gossip column material prior to the Internet age makes for a huge gap in my knowledge base of Hong Kong cinema. Anyway, the only other comparable entry to “Sing Girls” that I can think of is one for “Bond Girls,” which basically makes Stephen Chow on par with fictional superspy, James Bond. I guess Chow’s starring role in that 007 parody From Beijing with Love was an apt one. *Okay, I’ll admit it: after watching Chinese Odyssey 2002 for the first time in years, I was trying to see what Ms. Athena Chu was up to nowadays.